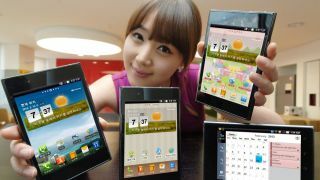 LG's Optimus Vu was launched earlier this year as a direct competitor to the Samsung Galaxy Note. After recording more than 500,000 units sold, LG is now planning to bring the phone stateside. According to the latest press release from LG, the South Korean manufacturer hopes to launch the Optimus Vu in the U.S. during the third quarter of 2012. Not only will the Vu finally make its way into the hands of U.S. customers, but it will be an LTE version to boot. The press release points to the U.S. version coming with Android 4.0: Ice Cream Sandwich, which should get the most from the phone's 1.5GHz dual-core Snapdragon S4 processor, 1GB of RAM, and 32GB internal memory. Unfortunately, though LG shared a bit of their strategy for the U.S., they didn't reveal all the pertinent details. The Optimus Vu still doesn't have a carrier stateside, though based on some leaked photos, Unwired View believes Verizon will support the phone. When it launched in March, the Optimus Vu retailed for approximately $890 without a plan, while the Galaxy Note sans plan currently retails for $600. To compete with the Galaxy Note, LG and Verizon may have to come down in price just a tad, particularly with rumors of a Galaxy Note 2 on the horizon. Until more concrete details about the Optimus Vu's launch are revealed, we'll just have to take solace in knowing the smartphone will be here soon.